Azarain is a Vigilant of Stendarr who has come to Dawnstar to investigate disappearances of his fellow Vigilants in the region. 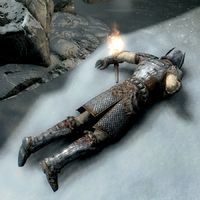 He was staying at the Windpeak Inn but during the related quest you will find his corpse at the Windward Ruins outside of town, having been murdered by a Daedric cult. You will need to read his journal to progress the quest. He is also wearing a full set of Vigil Veteran armor. This page was last modified on 26 March 2019, at 23:31.